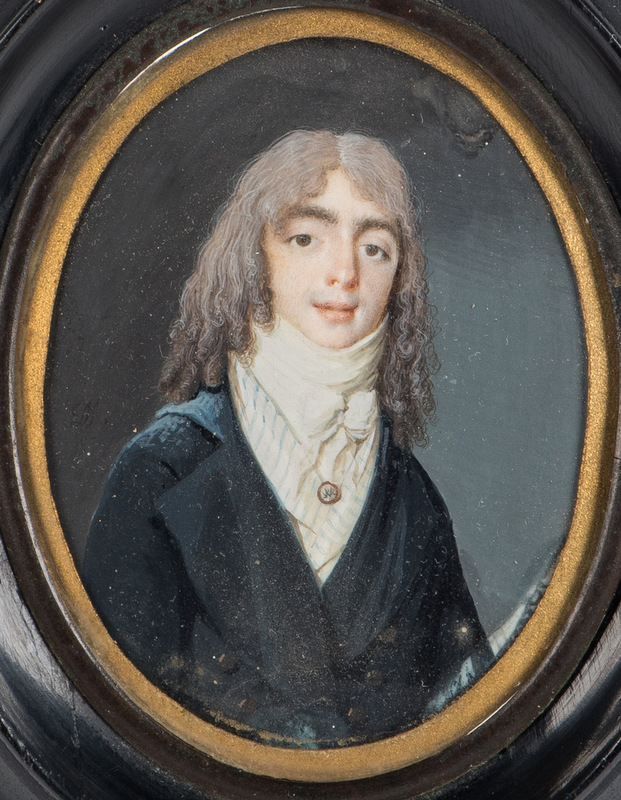 18th century miniature oval watercolor portrait, possibly Port Royal, Virginia, attributed to Philippe Abraham Peticolas (Pennsylvania/Virginia, 1760-1841). 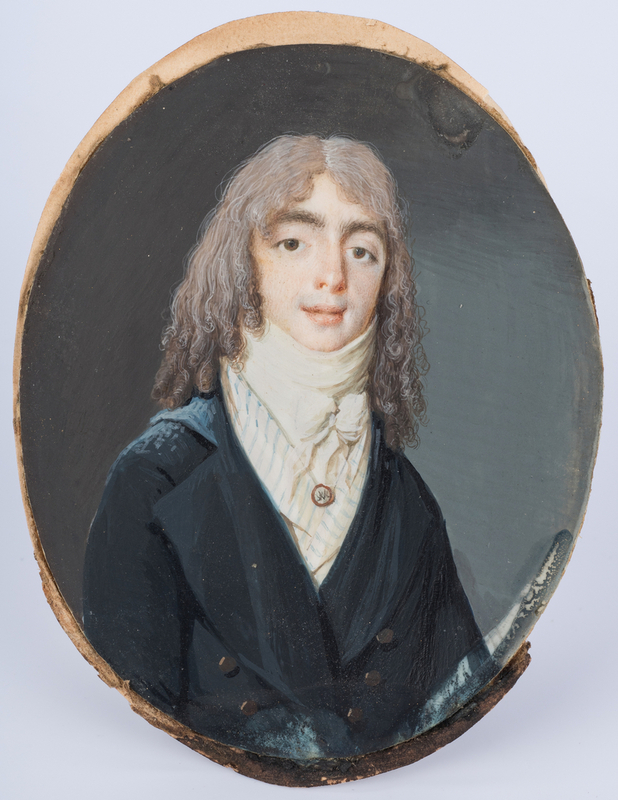 Painting depicts a young gentleman with long hair and prominent eyebrows, attired in a blue suit coat with blue striped vest and gold tie pin. 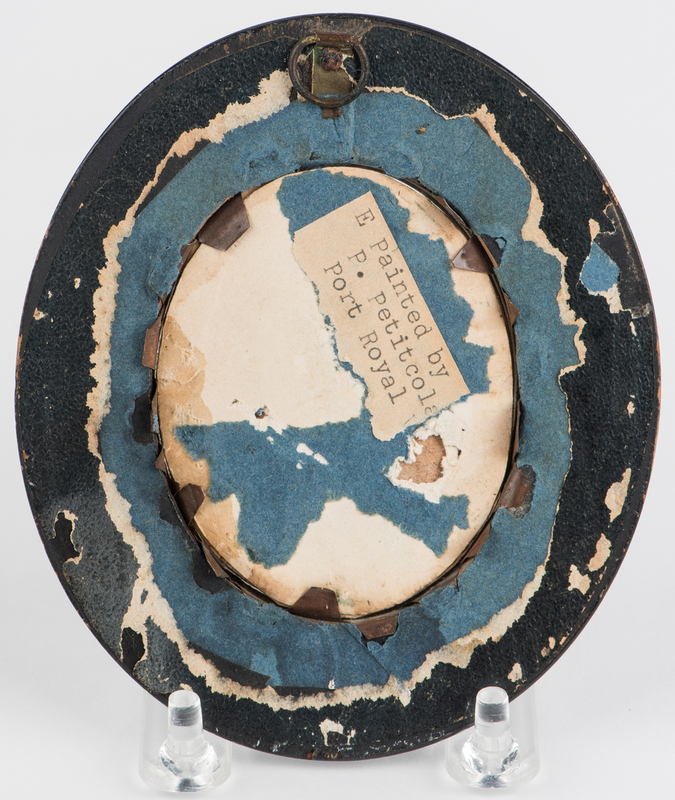 Remnants of a paper label en verso reads "E Painted by P Petitcola(sic)/Port Royal V–". Housed in an ebonized wood frame with gilt painted paper liner. Portrait – 3" H x 2 3/8" W. Framed – 4 3/4" H x 4" W. Biography: Philippe Abraham Peticolas served in the Bavarian army before immigrating to Santo Domingo (Dominican Republic) at about the time of the slave revolts in 1790. 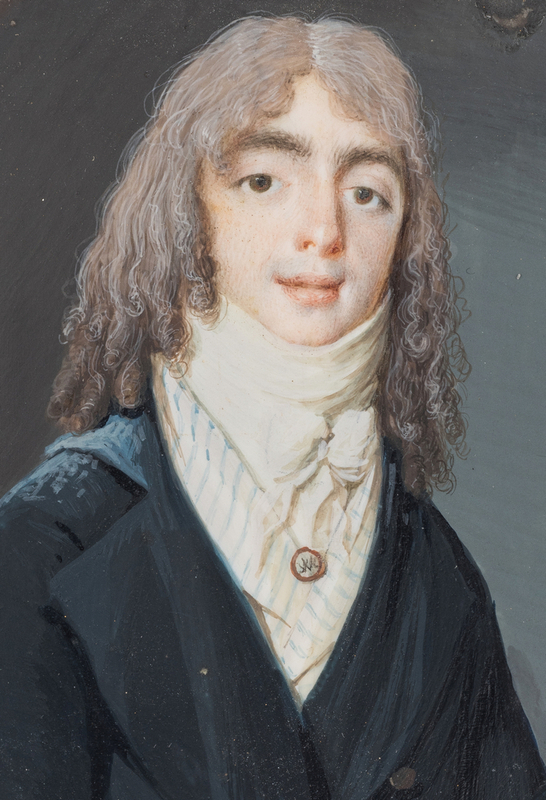 With his young son he fled the island for Philadelphia, supporting himself as a painter of miniatures and a print seller. 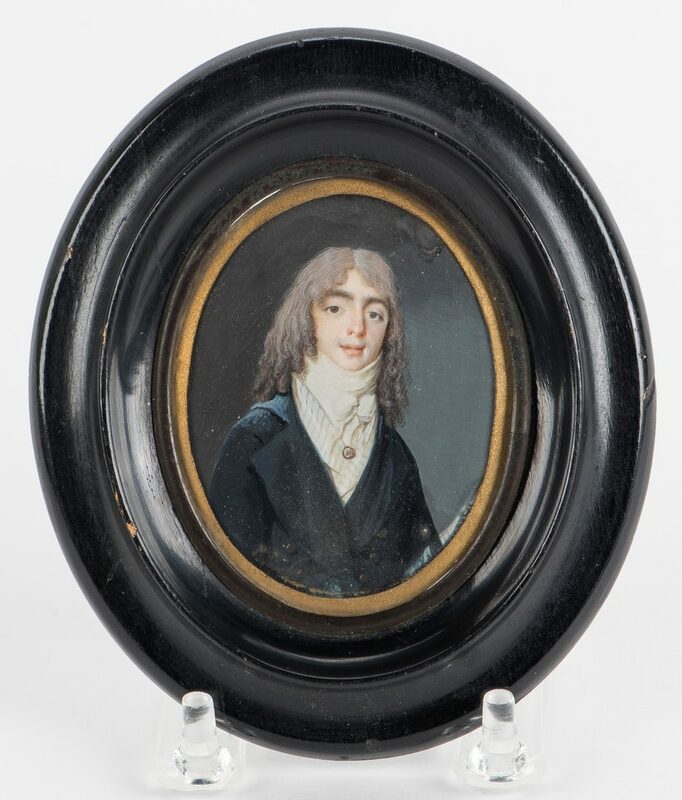 He worked in Lancaster, Pennsylvania, and Winchester, Virginia, and in 1804 settled in Richmond, where he taught music and became the city's leading miniaturist. 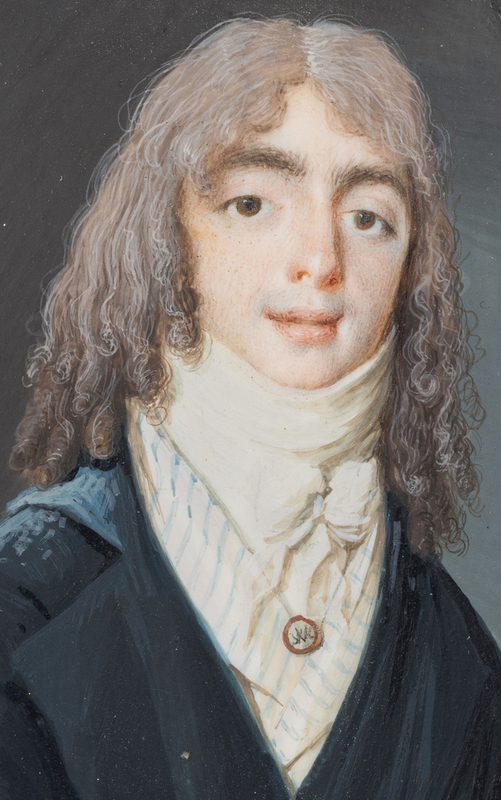 Two of his four sons were also artists. (source: Smithsonian American Art Museum). CONDITION: Small area of dampstaining upper right margin. Losses/rubbling lower right margin edge. Abrasions to the frame.